Today in Miami, the governments of US and Mexico are putting aside their well-publicized tensions of recent months and co-hosting a conference on security and governance in Central America´s Northern Triangle of El Salvador, Guatemala and Honduras, from where thousands of people flee extreme violence to seek asylum in the US and Mexico. 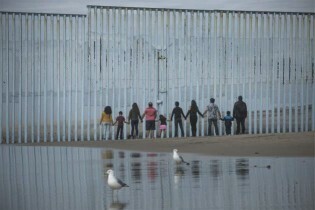 The sight of one of the most infamous borders on earth – roughly 1,000 kilometers of porous metal fence dividing lives, hopes and dreams between the USA and Mexico, is undoubtedly overwhelming, but not in the way we expected it to be. Ten years ago I arrived in Mexico for the first time. A heavy backpack strapped around my waist, I toddled over a large, concrete bridge that divides Mexico and Guatemala.